The DNR invited the public to a site demonstration to learn more about Bonanza Valley water monitoring. The August 23 event was part of the implementation of the Bonanza Valley Groundwater Management Area Plan and is an example of the DNR’s commitment to sharing groundwater information with the public. Twenty-two interested people attended the two-hour event, including several local and state media outlets. The DNR monitors stream flow, lake levels, groundwater levels, rainfall, evapotranspiration, wind speed and temperature. DNR will also review Bonanza Valley data gathered by other local, state and federal entities before adding to our data sets. We gain a better understanding of water movement through data collection and analysis. For example, DNR Water Monitoring and Survey Unit Supervisor Greg Kruse described water movement between groundwater and the North Fork of the Crow River that would otherwise be invisible to the observer. He said water can find its way into the stream by runoff, as well as by seeping into rivers through the riverbank when the groundwater level is high. When the groundwater level is lower, water can reverse course and seep out of rivers and into groundwater. Further DNR analysis of these and other data in the coming years can reveal whether groundwater supply is sustainable, as defined by State statute. Mark Hauck, DNR’s project manager for the Bonanza Valley Groundwater Management Area, talked about the groundwater plan for the area. He said groundwater use is vital to agricultural irrigators, livestock producers and community water suppliers in the Bonanza Valley Area. It is also critical to the health of Minnesota’s wetlands, streams and lakes. To continue enjoying its many benefits, we need to make sure groundwater use is sustainable. That requires accurate data. The five-year plan for DNR actions was launched in 2016. Data collection and analysis is one of several key actions outlined in the plan. Links to the plan and other information can be found on the Bonanza Valley GWMA web page. 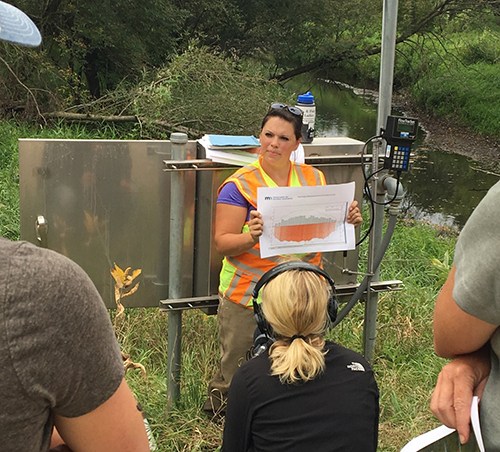 DNR Hydrologist Erynn Jenzen displays stream monitoring equipment and data examples near the North Fork of the Crow River.